The Fund for the Return of the Areas Affected by Terrorist Acts, the Kuwaiti grant for the first phase of $ 15 million. 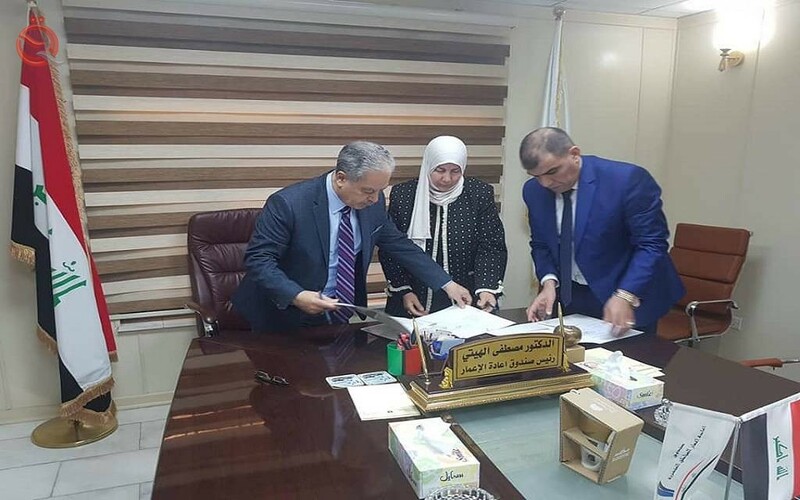 The Fund said in a statement that the President of the Fund Mustapha Al-Hiti signed a contract to activate the first phase grant of $ 15 million, allocated to the health sector in the provinces affected by terrorist operations. He pointed out that the consultancy contract for the first phase of the second phase has also been renewed and will cost $ 85 million for the health sector to rehabilitate the hospitals and health centers in the governorates affected by the terrorist operations. The Minister of Electricity, Louay Khatib, discussed Thursday with the Amir of Kuwait, the Prime Minister, the Speaker of the National Assembly and the Minister of Energy cooperation in the field of energy. "The Minister of Electricity, Luay Khatib, met today in Kuwait, Kuwait, in separate meetings, the Amir of the State of Kuwait Sheikh Sabah Al-Ahmad Al-Sabah, the Prime Minister Sheikh Jaber Al-Mubarak Al-Hamad Al-Sabah, President of the National Assembly Marzouq Ali Al-Ghanim and Minister of Oil, Electricity and Water Khaled Al-Fadhel. " The ministry added that "the minister discussed during these meetings ways of cooperation between the Republic of Iraq and Kuwait in the field of energy, as well as discuss a number of common themes." "We appreciate Kuwait's keenness to strengthen bilateral relations and look forward to carrying out promising investment projects in the energy field," Khatib said. The statement pointed out that "the meetings were attended by the Kuwaiti side, Undersecretary of the Ministry of Electricity and Water Mohammad Bushehri, Assistant Undersecretary of Electricity Transmission Networks Jassem Al-Nouri and Assistant Undersecretary for Water Projects Hamoud Al-Roudhan." He said: "On the Iraqi side, the Undersecretary of the Ministry Nafie Abdul Sada, the Director General of Electricity Transmission South Ziad Ali, and member of the House of Representatives Nasser Turki, Iraqi Ambassador Alaa Hashemi, and the first secretary at the Iraqi Embassy Ala Mohammed."